This piece originally appeared as part of my weekly newsletter, The Full Lid on 8th February 2019. If you liked it, and want a weekly down of pop culture enthusiasm, occasional ketchup recipes and me enjoying things, then check out the archive and sign up here. 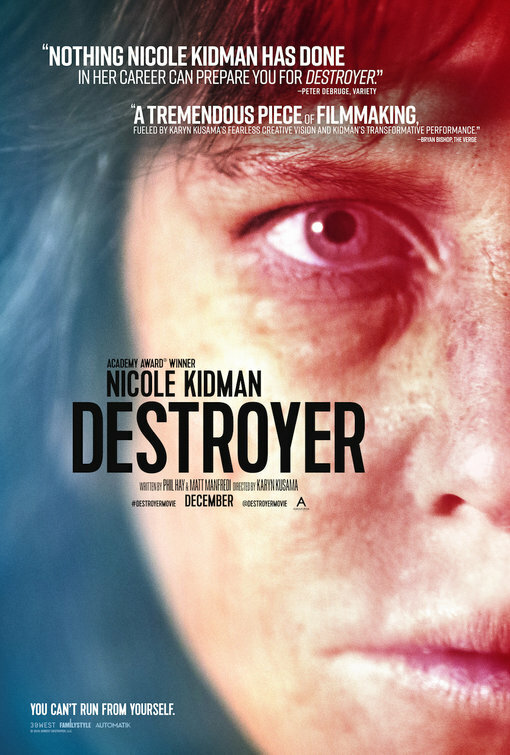 Karyn Kusama’s Destroyer is a film that haunts you from the start, just like Detective Erin Bell haunts her own past. Drunk, limping, face sun-blasted by years on the job, eyes permanently bloodshot she shambles into a crime scene, solves it and shambles out. As she does, you see the removal marks on the back of her neck. In the exact same place as the murder victim has a tattoo. Nicole Kidman doesn’t own the screen as Erin she breaks it apart with her bare hands. From the moment we first see her jerk awake in her car to the beatific final shot she never lets us go. Kidman barely blinks in this movie, barely talks and gives Erin an extraordinary gravity. This is a woman bowed under the weight of past events, acutely aware of that and murderously angry about it. She deals with that anger by walking in a straight line through every single contact she has until she gets to the truth and not a single step is easy. This role is far outside what Kidman is best known for but, like her turn in Aquaman, it actively benefits from that unfamiliarity. Erin is viscerally an outsider from the moment we see her and all we ever get is more context for that even as the film spirals her down to the only place it can end. As we learn about the disastrous bust that cost Erin most of her sanity and partner Chris (Sebastian Stan doing excellent work) his life, the movie structures and defines itself through the consequences of that day. One gang member is dying, another is serving penance giving out free legal advice, two more are orbiting out in the shadows, carrying out more crime and living off the proceeds. All adrift, all alone, all being dragged into one final catastrophic collision by and with Erin. There isn’t a single bum note here but Tatiana Maslawny, unrecognizable as a fellow gang member, and Bradley Whitford’s glorious louche track-suited lawyer really stand out. Destroyer is still playing in theaters and you should absolutely see it if you can. If you can’t, Kusama’s The Invitiation is on Netflix, is fantastic and makes a really good movie for the first week of Women in Horror Month.